I generally speaking keep a notebook on each novel I write for ideas. In there I include character profiles. I have descriptors I use. Traits I want to keep in mind for future reference. I keep it fairly simple and this is the method I have always used. It is interesting to map out your characters in a little more depth though. Get into their minds a bit. Thing about their history. Their back story. Their philosophy. Their personality. I found this profiler for your character consideration. It might be a good exercise to engage in. Something I might consider. If not this particular profiler than something catered to the works I do and similar in nature. Having notes about characters is always a good idea (maybe a picture or two as a reference), but it’s best in the beginning (at least) to not map out everything. In fact, I would go as far to say it’s best not to know everything about your character. You have to leave room for development, and space for ideas to grow. Of course things like hair, eye, skin colour are important to know from page one – but maybe a basic wordy sketch, rather than a detailed portrait of what they look like. What’s more important is what motivates them, what drives them, how they act. For instance: do they smoke? If so, what brand? How often? Have they ever thought of giving up? If they don’t smoke, why not? What music do they listen to? What’s the most embarrassing thing ever to happen to them? Those sort of random everyday questions are more useful in building up a character profile. BUT, be careful in doing so – you see, some questions don’t need to be answered right at the start. Some things you can allow to develop. Have an idea of who your character is, but remember they are nothing without a story. It’s the story that needs your energy and time. Some people get so stuck in character development they forget to write the story. That does help. Thanks. Normally I generally note the physical traits and personality traits I want to keep in mind as I go forward. I may add details when I am into the novel but in the beginning I do not have too much detail. However, while I have motivations and drives in my mind I never really record them. I think that would be a good idea to get down. Flesh it out a bit more. I should try practicing a more detailed format and see how it works for me. Adding in some key features. 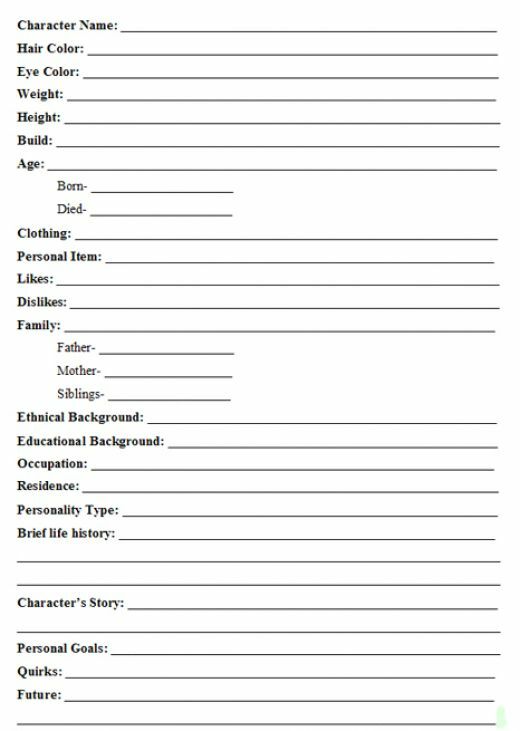 During the “Assignment Challenge” we were given a character sheet to fill out (which you can find on this post: http://jamessnaith.wordpress.com/the-assignment-challenge/characters/).